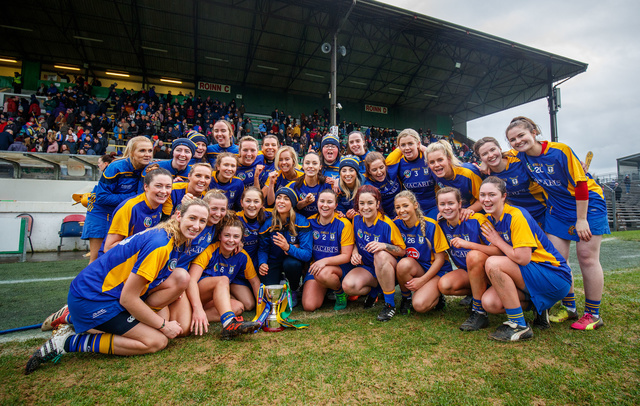 A DEVASTATING first-half display from Meath champions Ratoath laid the foundations for their AIB All-Ireland Junior B Club Championship Final glory over a spirited Clontibret side in Páirc Tailteann. Such was the whirlwind of positive score taking, mixed with Sinéad Beagan’s dead-ball accuracy, that the groundwork for the win was laid in the first 30 minutes of action as the Monaghan champions had simply no answer to the precise play of the youthful Ratoath team. To her credit Morgan didn’t let her head drop and went on to have a fine game, three notable saves in the second-half alone redeeming her performance. Beagan quickly fired over a captain’s score to maintain their healthy lead at the half’s closing stages. There was time for Clontibret to squeeze over their second point of the half, a free from Greenan - the option of shooting for a green flag was spurned by the centre forward. The start of the second-half was marred by a long delay after McGuigan was taken off with a head injury. Greenan pointed the free as they nibbled into the hefty deficit. Despite being under pressure at the back the Monaghan side held firm for long periods. Hannah McSkeane put on a supreme defensive display at centre back to stem the tide, and they succeeded in suffocated the Ratoath forwards. Ratoath did in fact go 25 minutes of the second-half without scoring and when the score arrived it was Beagan who again settled her young team with a crucial point.